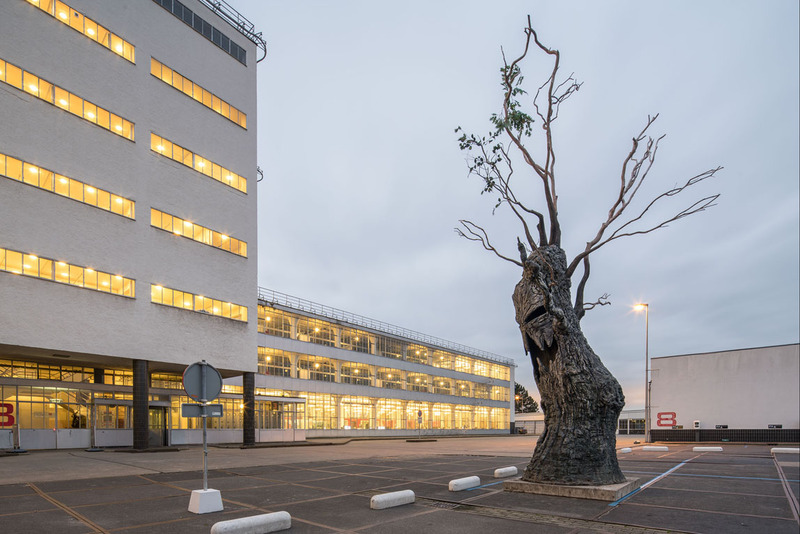 A grey, rainy sky provided the backdrop to the Van Nelle Factory, where the 20th edition of Art Rotterdam was located. The low hum of music from a group of boombox speakers outside the Van Nellefabriek got louder as I approached the main entrance. Once inside this UNESCO World Heritage Site, I was greeted by a playful, convivial atmosphere of colour and chatter. The Van Nelle Factory, dating back to the 1920s, had been home to a complex of factories, producing cigarettes to instant pudding. This is a temple to makers. As the ‘ideal Factory’, it expressed the values of openness, of opening industry out to the world. As I walked around this contemporary art fair, which showcased the talents of young, up-and-coming artists, it struck me that this art fair was also focused on something else – on making the art world more accessible. Emblazoned on the wall to the entrance of the CitizenM Cinema section was the statement: Art is for everyone. A particular word rung in my mind, as I visited galleries from Berlin to Ljubljana. Cosmopolitanism. Art Rotterdam was smaller this year – comprised of ninety galleries from eleven different countries – and aimed to strengthen cooperation between Dutch and international galleries. However, the artworks themselves made more intimate connections. Recognizing certain elements in the artworks, from tiger balm pots to mini neon-coloured scrunchies, it became apparent that the artists used resources readily available to them – paraphernalia that could be found in our cabinet drawers. I was constantly confronted by works that made me consider the everyday, the overlooked, from a fresh perspective. I became entirely enthralled by a set of nine oil paintings by Kurt Ryslavy (b.1961), an Austrian artist based in Brussels, of car rears. Hung on the wall together, they resembled a car park, with each car in its own parking space. As Ryslavy stated, “appreciating the beauty of a car rear will prevent threatening despair among professional drivers”. Unexpectedness greeted me at every twist and turn. In the Parisian gallery 22,48 m2, a small crowd had gathered around a large foam Camembert cheese. In the Amsterdam gallery Galerie Bart, I couldn’t hide my amazement as the installation carbon-14, element 5 (2018) by Alexandra Hunts (b.1990) was explained to me. The pencils, carbon black frames, and photographs of burnt wood were elements from different parts of the installation that referenced each other in surprising ways. Hunts had taken the oldest wooden sculpture as her starting point, and subsequently re-invented and transformed this material in each work. I learnt that she had created her own pencils and burnt the wood to make the carbon black frames, which encased photographs of this material. I couldn’t help thinking that this installation perfectly echoed its surroundings in the Van Nelle Factory, where many cycles of production had taken place over the years. Art Rotterdam was not only a haven for art collectors. It presented an overview of the international contemporary art scene, and the opportunity to ask questions, for those who wished to amass knowledge about the art world and gather inspiration from these artworks. Children engaged wholeheartedly with the works on display, attempting to touch rubber tongues in installations, or hypnotically watching large-scale video works such as Alex van Warmerdam’s L’Histoire Kaputt (2017-2018) where portraits morphed into paintings of kitchen utensils, houses, landscapes and dogs. ← SANNE CLIFFORD & Co in Amsterdam.